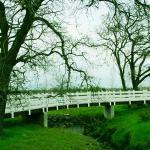 The Van Damme State Park in the county of Mendocino of Northern California (map) is known as the “Jewel of the Little River” and is a classic example of a northern California rain forest located right across from the Pacific Ocean. 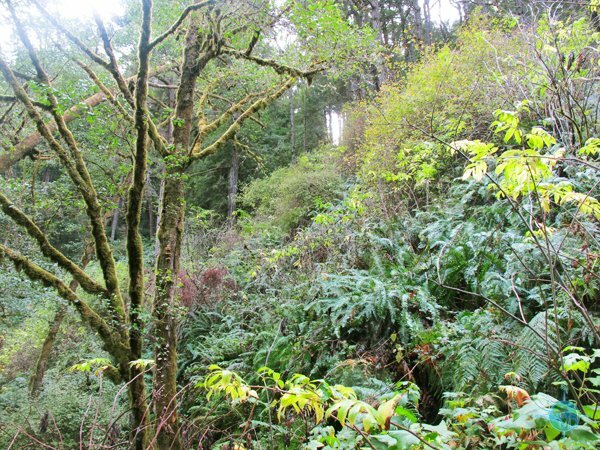 It’s filled with coastal redwoods, fir, alder, wild rhododendron, sorrel and ferns which provide a natural habitat for songbirds, raptors, mountain lions, bears and salmon. 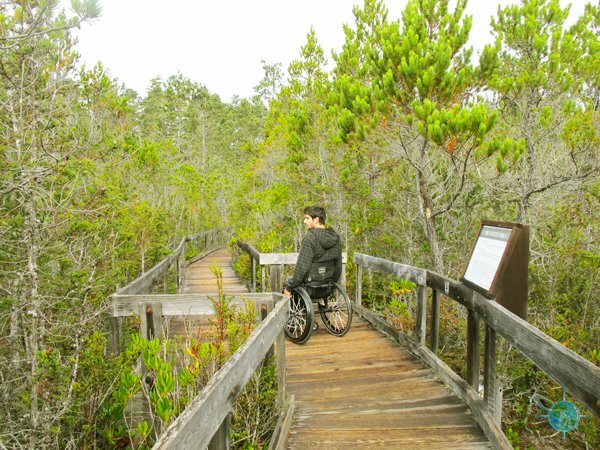 The most wheelchair accessible trail is located in the Pygmy Forest called the “Discovery Trail.” This specific trail is actually a national landmark and meanders through the forest for ¼ of a mile on a level boardwalk that is about 4ft wide. 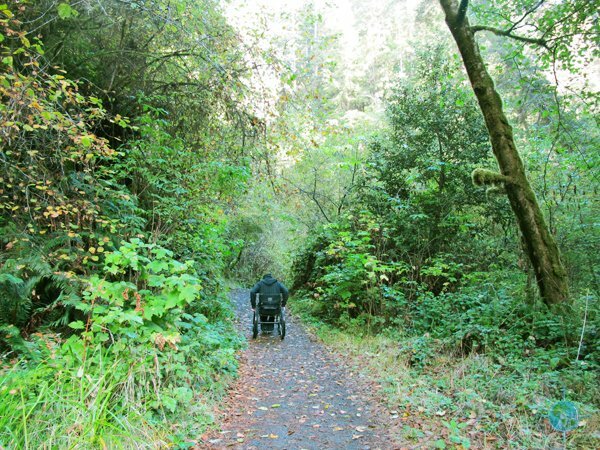 Access to the trail is directly from a handicapped parking spot. Dwarf cone bearing cypress and pine trees are the main attractions and although they are over 100 years old, some of them are only a few feet tall. 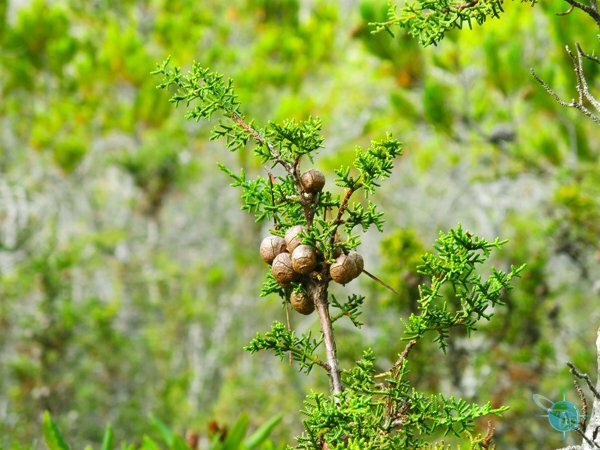 The soil these trees grow in is between 500,000 to 1,000,000 years old. There is no natural erosion to allow fresh soil from coming in, this allows the delicate and fluffy lichen called Reindeer Moss to thrive. Because of the delicate condition of the lichen, it’s important to stay on the path. 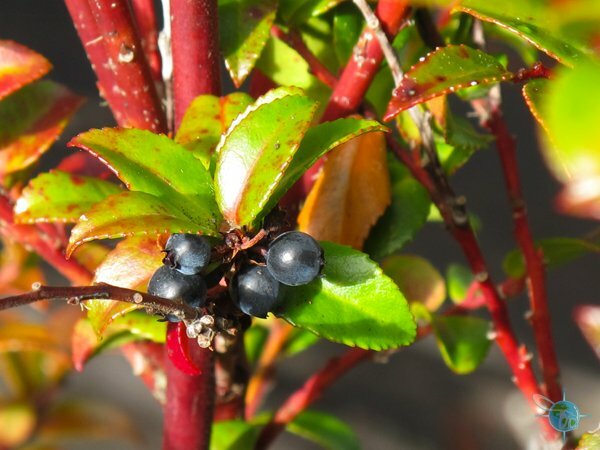 The conditions in the soil prevent these trees from growing. Along the trail one will find informational boards that describe the geological features of the forest and surrounding area. 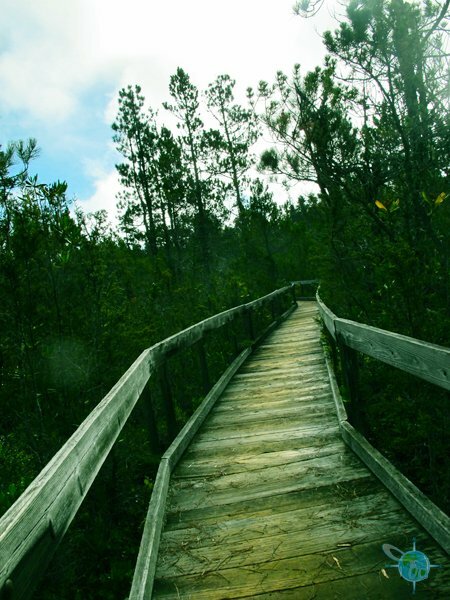 When the boardwalk trail ends a packed dirt one begins which will still be accessible for many, though some small rocks may be a nuisance. 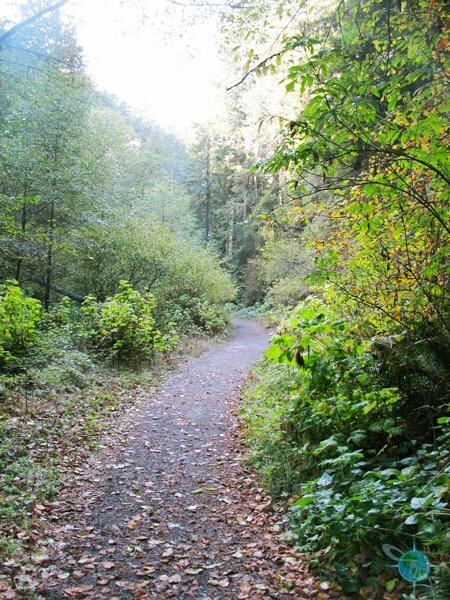 This part of the trail is actually the Fire Service Road and leads to the Fern Canyon Trail, however, after almost about .2 miles that trail become too steep and rocky. 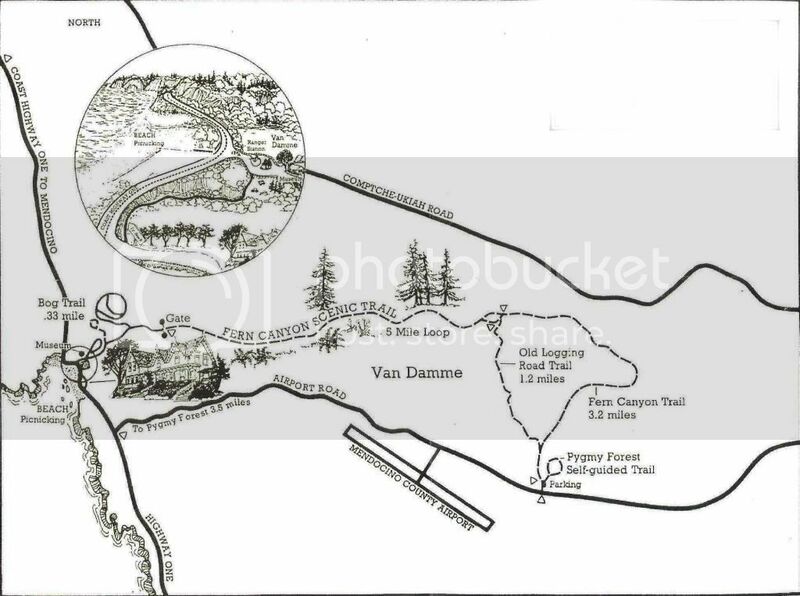 To get to the Pygmy Forest go south on Highway One for another ½ mile past Van Damme State Park to Little River Airport Road, and head inland (east) for 2.8 miles to the signed parking lot and trailhead on the left. No accessible restrooms are located at the entrance of this trail. 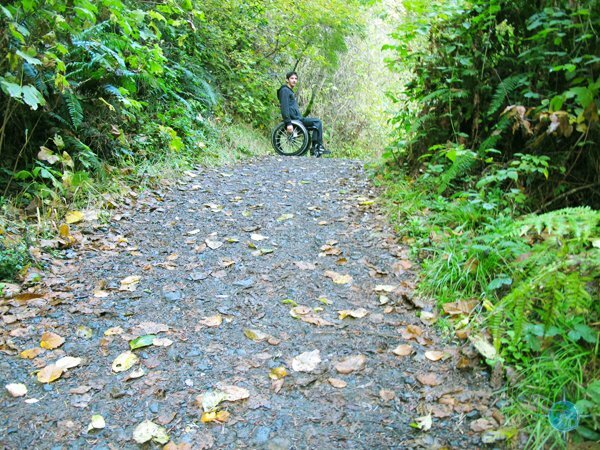 Better access to the Fern Canyon Trail is located up the road at the Van Damme gate and campground. Keep straight on the road, passing camp sites until the road ends. Here is a paved parking lot and although there is no designated handicapped spot, I had no trouble parking. 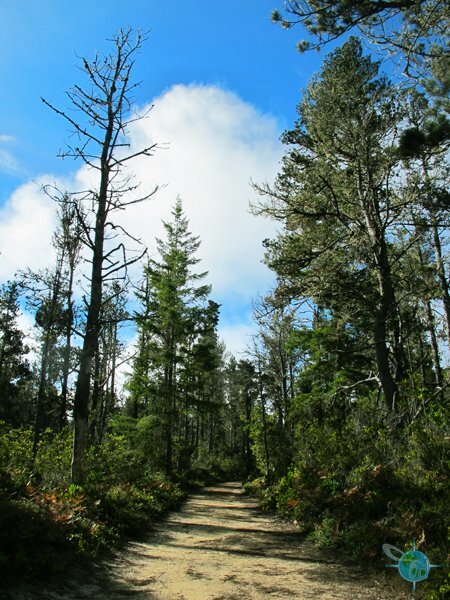 The trail is about 5 miles and is often saturated with natural elements of the surrounding forest. The trail itself is about 4 feet wide and made up of broken concrete. Sometimes, however, the trail narrows as little as 30 inches. 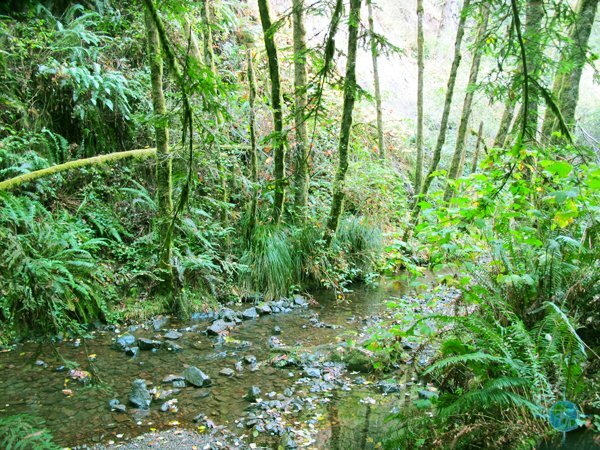 The trail follows the Little River into the fern-carpeted canyon filled with young redwoods, red alder, big leaf maple and Douglas fir as well as many wild cucumber and berry bushes. 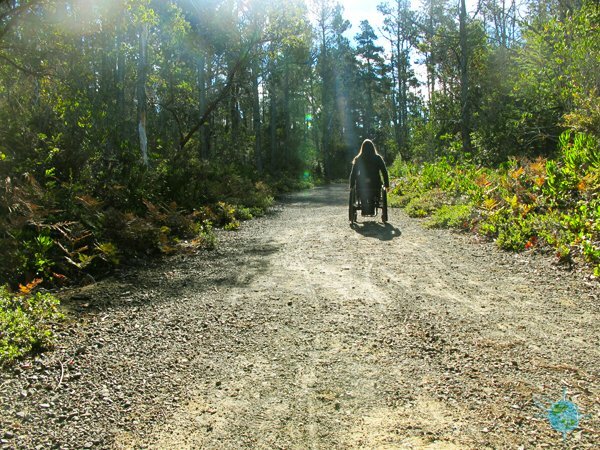 The trail has ten bridges/hills to cross, some of them too steep for most manual chairs users to conquer without assistance. About .1 mile into the trail, one will encounter the first hill. This one was too steep for me to climb in my manual wheelchair so I turned about. 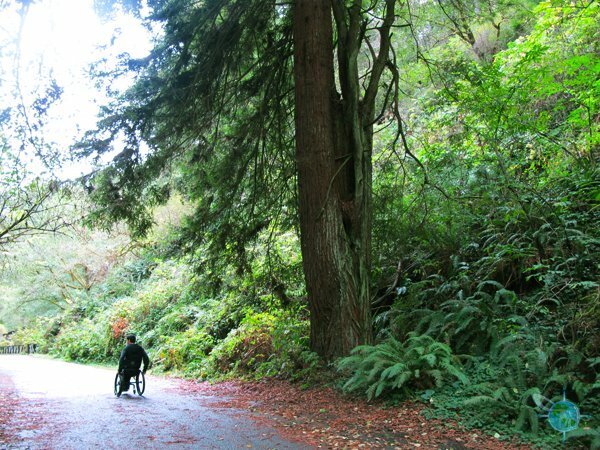 A friend who uses a power wheelchair and was able to hike further explained to me that the bridges/hills end at the 1.5 mile mark and then leads you to a small redwood forest. She continued for a couple of miles before a washout of the trail forced her to turn around. After I turned around, I decided to cruise along the paved road that bordered the campsites. It was the beginning of all and saw virtually no campers. 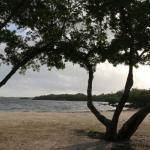 The paved trail was a lovely, flay stroll. At one point there is fork in the road, which can take you up to another campsite area, though this one is does not run along the river and gets a little steep. A generally accessible combination toilet room and shower is located near campsite 11. Toilet permits front transfers, and assistance may be need to reach shower controls from bench. 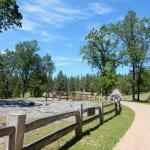 Campsite #7 and #10 are paved with wheelchair accessible picnic tables. An outdoor amphitheater has accessible parking and a ramp that leads to accessible spaces on top. Furthermore, the visitor’s center is wheelchair accessible. Here or at the rangers station at the front gate is where you can rent a beach wheelchair but this must be done so 48 hours in advance, phone number 707.937.5804.